LMC Sizing Shakers are used to separate dry, flowable products by specific size. Our sizing shakers have proven themselves over the years by separating products such as peanuts, almonds, beans, and much more. The machines are counter-balanced, which allows smooth operation and long life. LMC’s sizing shakers are capable of removing large objects like sticks and hulls and small particles such as fines and pieces. 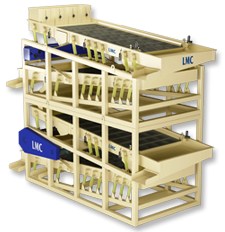 The screens of a typical LMC sizing shaker can be changed in only a few minutes, reducing downtime and increasing your plant’s efficiency. Since we manufacture our own screen, they can be configured for any sizing operation, Optional ball trays minimize screen blinding for maximum screen efficiency.